Standard sizes are 12" and 16", but these can be customized. 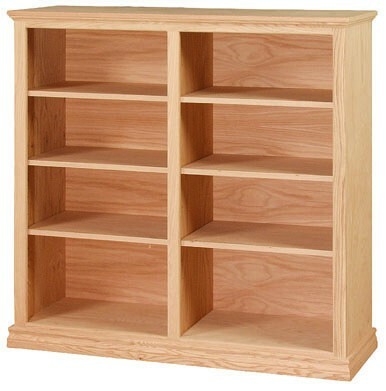 The minimum depth is 9" for Contemporary, Traditional, Shaker, and Fluted bookcases and 12" for all others. The maximum depth is 48". 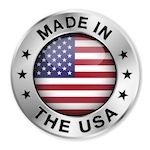 The height and width can both be customized to any measurement. The minimum height is 20" and the maximum is 96". The width can also be customized to any measurement. 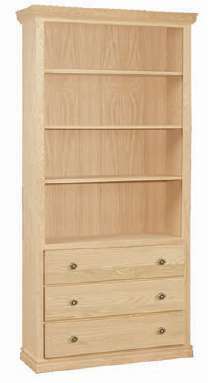 The minimum width is 12" for Contemporary, Traditional, Shaker, and Fluted bookcases and 18" for all others. There is no cost to decrease the height or width. Simply choose a bookcase that is equal to or larger than the desired height and width and enter the desired dimensions into the text area. 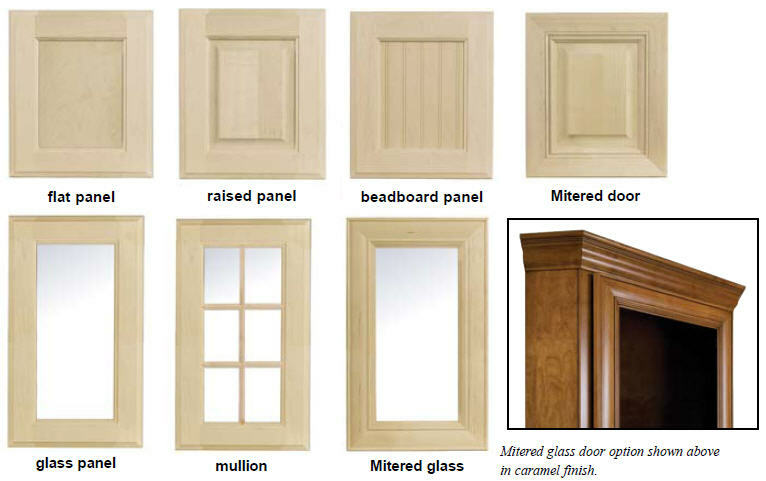 All styles except Contemporary have have moulding along the top and base, front and sides. Bokcases 72"H or taller have crown moulding across the top. Shorter bookcases have finished, quarter-round top surfaces and are top-trimmed in cove moulding. 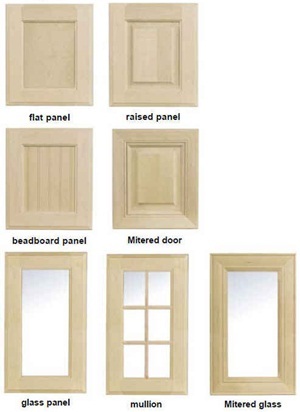 Flush side moulding options offer you the ability to remove the moulding from either the right or left sides, or both sides, while leaving the moulding on the front top and base. When creating a flush wall look, you may desire to align two or more bookcases against each other and have the moulding match. Flush right and flush left bookcases will enable you to create the look you want. To create a wall unit with three bookcases, order a center unit with both sides flush, one bookcase that is flush right, and one bookcase that is flush left. To remove the moulding from the sides, select the appropriate option. There is no additional charge for flush sides. 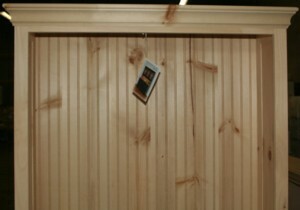 Below is an example of flush side moulding. Bookcases can have optional door kits added to them. Doors taller than 35" will have double panels. Bookcases 48-60" have a center divider and will have twice as many doors. 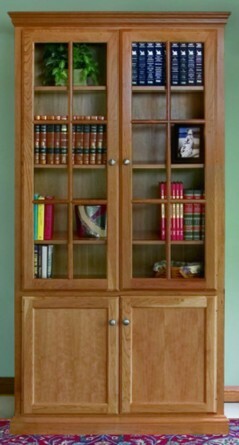 Bookcases that are 5 feet tall or smaller can have a full door kit added. Bookcases 12-18" wide will only have one door, those 24-42" wide will have two doors, and those 48-60" will have four doors. The doors on 3-5 foot bookcases will have double panels since they are very tall. 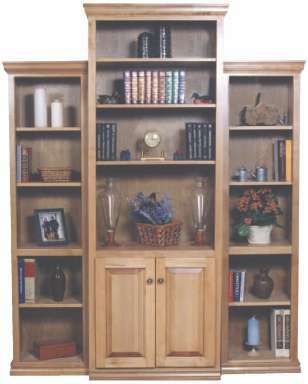 All bookcases larger than 4 feet tall can have a lower door kit added. The standard height of a lower-door kit is 30". The price for a kit is higher for 4-5 foot bookcases because they need to have an extra fixed shelf added. Bookcases 12-18" wide will only have one door, those 24-42" wide will have two doors, and those 48-60" will have four doors. 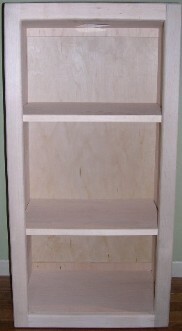 All bookcases larger than 4 feet tall can have an upper door kit added. The height will be the bookcase height minus 30 inches, since that is where the fixed shelf is located. Bookcases 12-18" wide will only have one door, those 24-42" wide will have two doors, and those 48-60" will have four doors. The doors on 6-8 foot bookcases will have double panels since they are very tall. 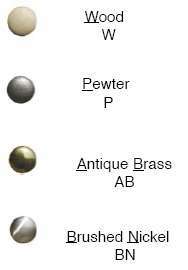 Vintage and Fluted bookcases with doors have a hardware option with a choice of wood, pewter, antique brass, or brushed nickel knobs. 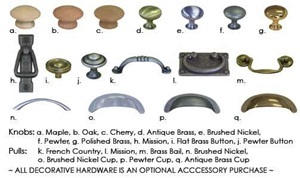 On other styles, there is no choice, but you can purchase your own optional hardware to replace what comes with the bookcase doors. Traditional bookcases come with burnished brass, Cottage and Shaker come with wood knobs, and Harvard comes with antique brass. This option involves some changes to the bookcase to ensure that it can be safely hung on a wall and will look appropriate. On the Contemporary style bookcase, the top and bottom trim or molding is modified to look the same (1-3/4"H rail at top and bottom). The bottom is also modified so that it has rounded off instead of square corners and will also have an additional 1/4" of plywood added for better support. 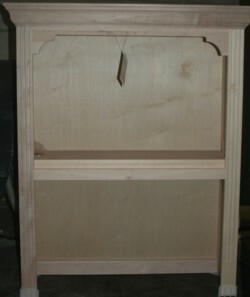 On the Traditional style bookcase, the bottom trim will be left off. Hanging strips are added to the top and bottom inside of all bookcases. 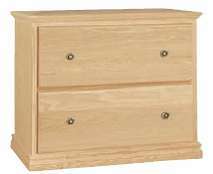 This option removes the base of the bookcase to create a "hutch" that can sit on top of another piece of furniture, such as an office desk, a bedroom dresser, or another bookcase. On bookcases taller than 43" high, you can specify the height of the fixed shelf. The standard shelf height is 30", but 24" may be a better height for 4' and 5' bookcases. Specify the desired height from the bottom when ordering. Note: If you add a lower door kit to a hutch, we will need to add a rail to the bottom to provide stability for the doors. Photo at Upper Right: Fluted Harvard Bookcase converted to a hutch (the adjustable shelves have been placed above fixed shelf for transport). This style is no longer available. Photo at Lower Right: Traditional Bookcase converted to a hutch, 4'H x 52"W, with a fixed shelf at 16"H. There are no adjustable shelves underneath the fixed shelf on a 48"W or wider bookcase. This option is only for 7-8 foot tall corner bookcases. It divides the unit into two pieces, a base and a hutch that sits on top. 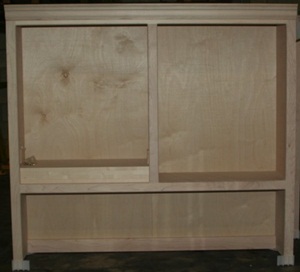 The base and hutch are attached using dowels installed where the side pieces meet. You can achieve virtually the same effect for regular bookcases by buying one short bookcase and converting another to a hutch. This option replaces the back of the bookcase with beadboard. The beadboard will be visible behind the shelves. Bookcases 48-60"W automatically come with a vertical center divider down the center of the bookcase that is 1-3/4"W. A 48-60"W hutch will only have the center divider above the fixed shelf, leaving the area below open with no shelves. Smaller bookcases can have a center divider added for an additional fee. It could theoretically be added to any width bookcase, but may look odd on narrow ones that are already less than 18" wide. This option allows you to add a fixed shelf to any bookcase. This feature is standard on 6', 7', and 8' high bookcases as well as on other bookcases that have been converted into a hutch. 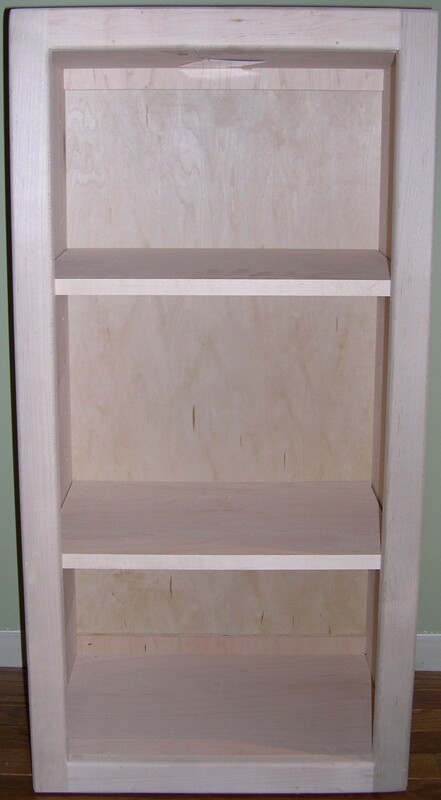 The standard height of a fixed shelf is 30" but any height can be chosen. 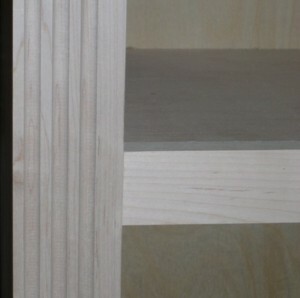 The front of a fixed shelf is 1-3/4" tall, although the shelf itself is only 3/4" thick. There can be no size customizations with these bookcases, since the drawers would not fit. The drawers have a usable depth (top to bottom) of about 5-3/8". The drawers in a 12"D bookcase will have 10-1/8" of usable space (front to back) and the drawers in 16-24"D bookcases will have 14-1/8" of usable space.